Might and Magic 8,5 team wishes you all happy New Year and presents an update accordingly. This time we will tell you about the new location - the Snake Islands. There is not much known about the snakemen. Long time ago they inhabited the Dagger Wound Islands before the lizardmen, having their own city and the Temple, which is now referred as the Abandoned... but then they mysteriously disappeared. Up until now they were considered extinct. However, now they return! The courageous Hero of Jadame with a brave team of adventurers opened the temple door, recovered the snake idol and fulfilled the prophecy of the Snake! An ancient portal appeared, leading to the Snake Island, a home of the Snakemen people. After a long time the Snakemen regained a chance to return to the Dagger Wound Islands. 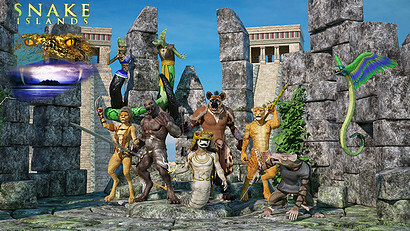 The heroes of Might and Magic 8,5 will be able to discover the new nations on Enroth, know more about their life and traditions, figure out the difficulties of the class relations in the snakemen society and even to participate in the conflict of the warm-blooded and cold-blooded.